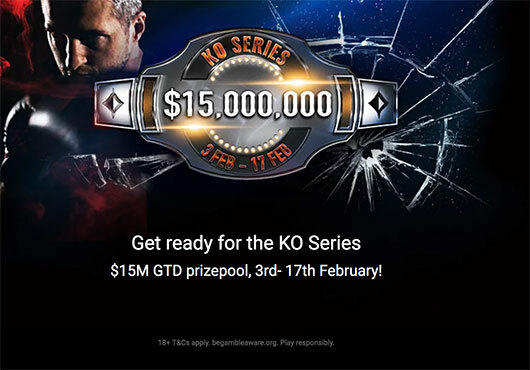 The KO Series is back for another festival of aggressive knockout poker! Running 3rd -17th February, there's a huge combined prizepool of $15M GTD to play for across a wide-range of PKO formats. Each tournament will be a Progressive Knockout format. Top placed finishers are paid just like any other tournament, but for every player you eliminate you'll receive a cash prize, whilst your own bounty increases. And having removed the rake for the bounty element of PKO tournaments, partypoker PKOs offer you incredible value. Kicking off 17th February at 19:00 CET (18:00 GMT), look out for the biggest tournament of the series. With a huge $500K GTD prizepool, the action is set to be immense. You can buy in for $530, or win your seat through a satellite for as little as $0.55! Satellites are running now. Only the strongest will survive, show no mercy in the KO Series! 18+, Gamble Responsibly - www.begambleaware.org T&C's Apply.